I love the sound just after it has snowed.........silence. Everything is so peaceful and calm it's lovely. Everything looks so pretty, until it all gets disturbed by us humans anyway. I don't think I've ever seen so much snow before. We've had so much recently. I love watching the icicles as they begin to thaw. I caught the one above just as a drop of water fell from the tip. I am also pleased to say that I can now cross off something else from my bucket list or list of wishes which ever way you like to look at it. 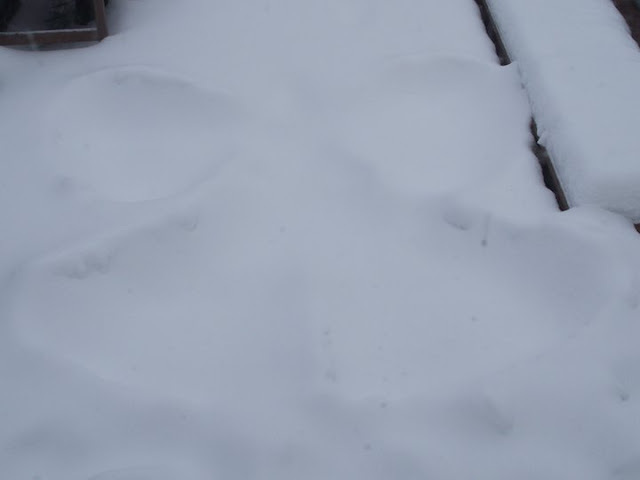 I have officially made my first ever snow angel. And it was still visible the following day after yet more snow.